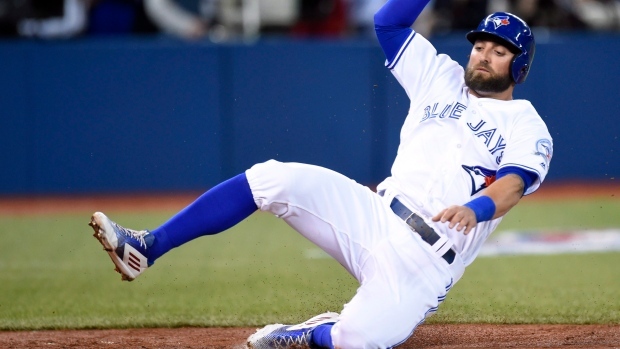 Kevin Pillar scored the game-winning run on a heads-up base running move touching the plate just ahead of the tag as the Blue Jays edged the Rays 2-1 to avoid the series sweep. Welp, the first 2 game of this series went sub-optimally. Today, the Blue Blue recalled their top catching prospect Danny Jansen, who will likely be behind the plate for Sean Reid-Foley's MLB debut Monday in Kansas City. Marcus Stroman made the scheduled start, despite a blister problem that is affecting him when he throws a slider. How long did Stroman last today and did he get any run support? Here is today's game recap. Marcus Stroman deserved to leave with the lead. He pitched well enough to win, scattering 5 hits over 5 innings and allowing just one run. Unfortunately Stroman was forced to leave the game after the 5th inning when the blister broke open. On camera, the blister looked sizable and it wouldn't surprise me if Stroman was forced to miss at least one start. The bullpen was rock solid again giving up just a single and a walk (both by Danny Barnes) over 4 innings). Ken Giles needed just 9 pitches to pick up the save. The offence did just enough to eke out a victory today and you could say they got lucky with that victory too. If Pillar had hesitated for a second, he would have been out at home. Up next, the Blue Jays head to Kansas City to begin a 4-game series in hot, hot weather. Righty Sean Reid-Foley will make his major league debut, likely alongside battery mate Danny Jansen. The Royals will counter with right-hander Brad Keller.